Property owners vs. Rental scammers: Who are you sending your money to? Richard Cohen started receiving calls from interested tenants for a property he manages in Dundalk. They liked the pictures and were pleased with the price. "They were interested in the property and it was $800, which is less than half of what the actual property is, and we asked them to send us what they were looking at and they did exactly that," said Cohen, the owner of Bay Properties . 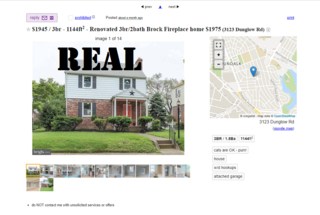 It was a link for a Craigslist posting with the same photos and description he provided the real estate agent, but it wasn't their post. This post had a significantly reduced price and the contact person was someone named Mary. "We actually were able to get them on the phone and try to get them to meet us at the property but they seemed to give us every reason not to," Cohen said. Excuse after excuse on why they couldn't meet in-person. Instead they suggested Cohen drive by the home and take a look. And when Cohen's team started asking more specific questions about the property, particularly the backyard, "Mary" was clueless. "She or he literally dodged a question so many times and then finally he said, 1.5 square feet, which would be like a piece of paper, makes no sense whatsoever," said Cohen. Cohen reported the ad, put up a new one on Craigslist to counter the fake one, but says he's lost interested clients, time, and money. Once the potential renters found out the real price, Cohen said they had zero interest. This is the second time in the last several years that Cohen has gone toe-to-toe with a scammer trying to collect payments on his properties. "Someone's living there and shows us the lease that they signed and it wasn't us and that was a situation that was handled and the people lost money, you know it's unfortunate," said Cohen. He's come to learn that owners and leasers aren't just fighting misinformation, they're having to convince people that it's not luck or good timing, the dream home they imagined at a price they can afford is nothing more than a fantasy. "I think somebody is just being wishful or, it's sad, somebody might even be desperate and they think they found something great," said Cohen. Inspect the property before sending any money. If they can't meet you then move on. If the rent is much lower than similar homes in the area, that can be a red flag. 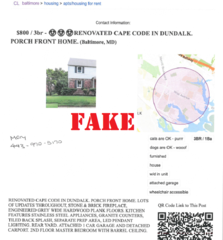 For more information on rental listing scams, click here .